If the Senate Democrats succeed in defeating the Kanvanaugh nomination with these women’s foggy, ephemeral and unspecific “memories”, we will have entered a new stage in the decline of American civilization. Let’s be clear; these are not, as they have often been referred to, “accusations”. They are mere denunciations, put forward by politicians who are pandering to “activists”. Denunciation is what happens when an accusation is saved or fabricated and timed in order to damage an individual and/or process and achieve a personal or political goal regardless of the truth or validity of the facts. Denunciations have been associated with the most infamous and cruel movements and regimes in human history. They were a mainstay of repression and terror in the Spanish Inquisition, The Salem Witch Trials, The Third Reich, The Stalinist Purges, Mao’s Cultural Revolution, Pol Pot’s Cambodia and ISIS’s Islamic Republic. A denunciation, if it is not identified, debunked and punished as such, can destroy in an instant the lives, dignity and livelihoods of everyone the touch.We are seeing that now in the Kavanaugh nomination. 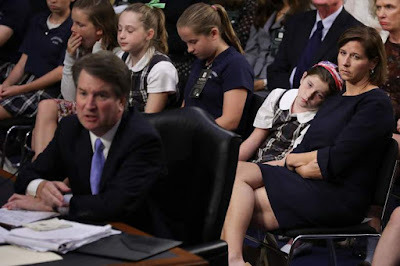 From the opening of the hearings, when the “activists” in the gallery erupted in coordination with the obstructions and whining of Booker, Harris et al to the dismay and terror of the Kavanaugh family and their daughters, to the cynically timed and orchestrated introductions of the denouncers, one thing is clear. There seems to be no depth of shame the extreme left will not sink to and no craven pandering to their emotions below which the Democrat partisans will not lower themselves. But the timing, negotiation tactics and invincible callousness of the Democrat Senators have not just attempted to destroy a fine man and his family. It has also projected two women, who, by their own admissions, are confused and unsure of what they are alleging, into a moral and legal crucible they did not understand at the outset. They will pay the price for allowing themselves to be used in this way but there is a greater concern. The denunciation of Judge Brett Kavanaugh, tapping into the already super-heated witch hunt atmosphere created by the Me Too phenomenon, has opened the door that leads directly, if not quickly or inevitably, to the Gulag Archipelago, Auschwitz, and the killing fields. “…in every village there were people who in one way or another had personally gotten in the way of the local activists. This was the perfect time to settle accounts with them of jealousy, envy, insult. A new word was needed for all these new victims as a class—and it was born. By this time it had no "social" or "economic" content whatsoever, but it had a marvelous sound: podkulachnik — "a person aiding the kulaks." In other words, I consider you an accomplice of the enemy. And that finishes you! The most tattered landless laborer in the countryside could quite easily be labeled a podkulachnik."